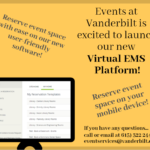 University Departments and outside clients that host events in the Student Centers/ESB/Wond’ry event spaces are required to request a quote from Vanderbilt Catering. If a group’s needs cannot be met by Vanderbilt Catering, a caterer from the approved catering list may be used. All outside caterers must provide their catering license and proof of insurance. They are also required to meet with the event manager to discuss Student Center/ESB/Wond’ry event space policies prior to catering any events in these facilities. All food and trash must be removed from the room after the event. A housekeeping work order will be placed through Reservations and Events for all events with food.